NESPS - Is Fellowship Training Required to Pursue an Academic Plastic Surgery Career? Is Fellowship Training Required to Pursue an Academic Plastic Surgery Career? Francesco M. Egro, MBChB, MSc, MRCS, Brandon T. Smith, MS, Alex Stavros, BA, Carolyn Murphy, BA, Vu T. Nguyen, MD. BACKGROUND: The competitive nature of an academic plastic surgery career has led to an increase in sub-specialization. Residents interested in a career in academia are therefore left with the dilemma of the value of pursuing further fellowship training. The aim of this study is to assess the benefits of sub-specialty fellowship training to pursue a career in academic plastic surgery. The hypothesis was that fellowship training is essential to pursue a successful academic plastic surgery career. METHODS: A comprehensive database characterizing all current academic plastic surgeons participating in certified residency programs was created by cross-referencing 2018 ACGME program reports with online faculty website listings. Nine-hundred and thirty-one faculty met inclusion criteria and were included in the study. Group comparisons were made using Student's t-test, Chi-squared test, and Multivariate Logistic Regression, where appropriate. RESULTS: Overall, 67.2% of all academic plastic surgeons have had clinical fellowship training. Of those who completed fellowship training, hand and upper extremity training was most common (35.5%), followed by craniofacial (32.8%), and microsurgery (28%). Rates of fellowship attainment were significantly lower among academics who graduated from residency within the last 2 years, compared to those who graduated before [OR: 0.68, (95% CI: 0.51-0.90)]. However, non-white plastic surgeons were more likely to have had fellowship training [OR: 1.6, (95% CI: 1.15-2.25)], as were integrated residency trainees [OR: 2.34, (95%CI: 1.54-3.56)]. Those who completed fellowship training were more likely to be assistant professors [OR: 1.44, (95% CI: 1.09-1.92)], more likely to be fellowship directors [OR: 3.23, (95% CI: 1.58-6.63)], and less likely to be full professors [OR: 0.66, (95% CI: 0.49-0.90)]. After controlling for individual variation in years of post-residency experience, differences in fellowship attainment were no longer significant at the assistant professor [OR: 1.32, (95% CI: 0.87-1.99)] or full professor [OR: 0.89, (95% CI: 0.56-1.43)] positions. Additionally, fellowship attainment did not correlate with the size of the employing academic program, population of the city of practice, being a residency director or chair. CONCLUSIONS: Rates of fellowship attainment have fallen significantly among recent graduates. However, those of non-white background or integrated residency training are more likely to have pursued fellowship training. 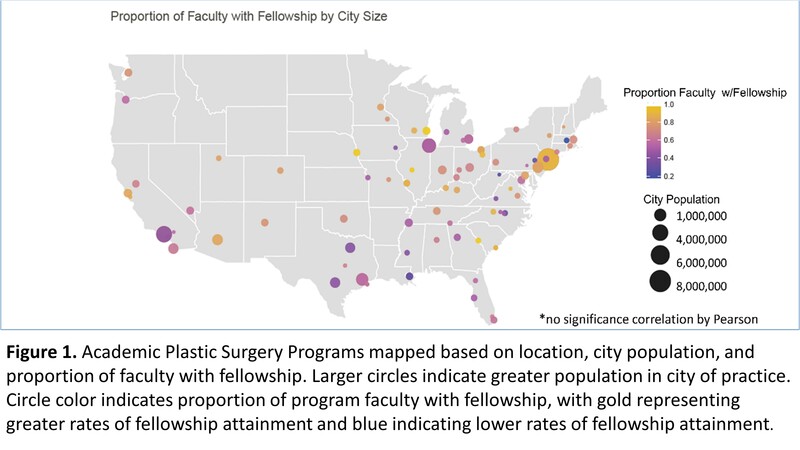 Nonetheless, the proportion of fellowship holders is homogeneous among academic faculty and leadership positions, and currently there is not enough evidence to justify that having a fellowship leads to greater entry or advancement in academic plastic surgery.